What's the hottest trend in chef fashion? The answer, and long awaited solution to ill-fitting clothing: Bye, Bye UNISEX! When the Chef's Emporium began selling the Chef Works brand in 1999, their product range did not contain a single chef jacket designed or sized specifically for Women. Nope, there were no ladies chef pants either. Thankfully an industry enlightenment finally dawned, and rightfully, women chefs received their own well deserved position in the catalog. We are so pleased to present a complete Women's Chef Clothing Line, by Chef Works, including coats, pants, kitchen shirts and headwear. Designed to fit your physic, our Women's Chef Jackets, by Chef Works, are a combination of both innovative styling and meticulous craftsmanship. 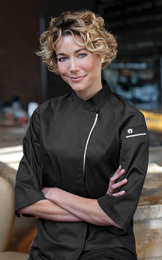 The V-Series VERONA Cool Vent Coat features a modern fit and profile, unsurpassed moisture management and elegant tailoring, taking the traditional chef jacket to the next level. Get a leg up on style and let comfort, function and fashion come together for you. Our Womens Chef Pants are far more streamlined and flattering than the ex-wide thigh and tight taper of traditional unisex baggies. .
Ultra chic and entirely sensible, the Chef Works Women's Universal Shirt are a winning uniform solution for front of the house staff. From baristas, cocktail servers, bartenders, hosts, waitstaff and food runners, this shirt meets the need with a savvy style. These shirts are available in an array of colors, mirrored by the Men's Universal Shirt Collection, and accented with contrasting thread colors and Cool Vent panels. With Beanies and Caps coordinated to match our Chef Coats and Aprons in COLOR, finding the right "topping" is a cinch. We highly recommend the new Cool Vent Beanies and Baseball Caps. They make perfect sense, Heat Rises - so why not vent it at the Top. Please feel free to contact our customer service line at toll free: (877)560-8065 if you have questions on sizing or would like assistance with picking out the perfect product for your needs.